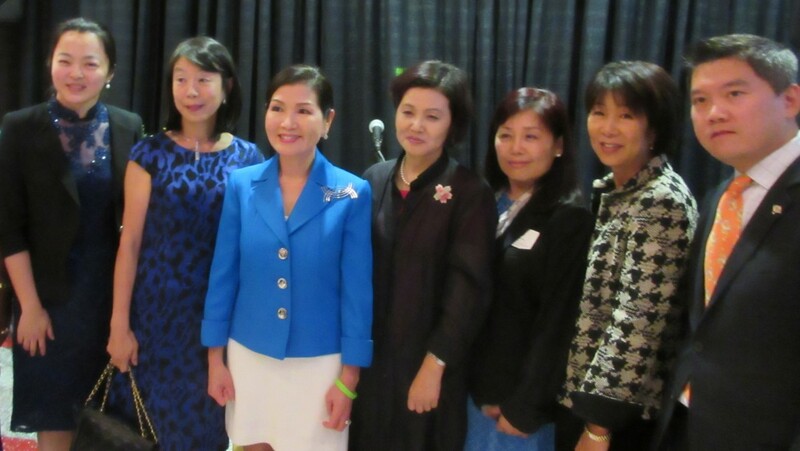 From left: Min Xu, counselor at Chinese embassy; Nobuko Sasae, wife of Japan's ambassador; First Lady Yumi Hogan; Seon-Hwa Lee, wife of Korea's ambassador; Mi Schill Kim, chair Maryland-Gyeongsangnam Sister State Committee; Kikko Murray, chair of Maryland-Kanagawa Sister State Committee; and Bob Zhang, chair of Maryland-Anhui Sister State Committee. Maryland’s Asian Sister States program, along with representatives of the ambassadors of China, Korea and Japan, honored First Lady Yumi Hogan at a welcome reception Thursday hosted by UMBC’s Asian Studies Program. Mrs. Hogan, a native of South Korea, is the first Asian American to serve as a state’s first lady in the country. She is an adjunct professor of painting at the Maryland Institute College of Art in Baltimore. Hogan thanked the audience of several hundred, mostly people born in East Asia or of Asian descent, for their support of Gov. Larry Hogan during his battle with lymphatic cancer. Gov. Hogan discovered the cancerous growth while shaving during a trade mission to Korea, China and Japan in June. Maryland has sister state relationships with all three countries. “We were overjoyed” to learn the governor’s treatment was going well, said Lee Seon-Hwa, wife of South Korean Ambassador Ahn Ho-Young. Maryland’s population is 6% Asian, and there are large concentrations in Montgomery and Howard counties, about 14% in each, with the highest percentages from India, China and Korea. Lee referred to Mrs. Hogan’s cooking of traditional Korean dishes, including the first kimchi refrigerator in the governor’s mansion, the homemade hot pickled cabbage that is a staple of Korean diet. Nobuko Sasae, wife of Japanese Ambassador Kenichiro Sasae, said she visited Baltimore for the first time Thursday, including stops at the Walters Art Museum and Baltimore Museum of Art. Both have large collections of Asian art and artifacts. Min Xu, counselor at the embassy of the People’s Republic of China, noted that Maryland will celebrate this year the 35th anniversary of its relationship with Anhui (Ahn-WAY) Province, Maryland’s first Sister State, and the 30th anniversary of Baltimore’s Sister City relationship with Xiamen. She said the embassy is busy preparing for Chinese President Xi Jinping’s state visit to Washington next month. Bob Zhang, chair of the Maryland-Anhui Sister State Committee, said the state will celebrate the anniversary in October, with a visit from an official delegation of the province. “People to people exchange is really important,” Zhang said. The event was held in the new Performing Arts Center of the University of Maryland Baltimore County, and was the idea of Kikko Murray, chair of the Maryland-Kanagawa Prefecture program with Japan. Mi Schill Kim, chair of the sister state program with Gyeongsangnam province, in Korea also spoke.